Our knowledgeable team are active members in the WordPress community, who have multiple plugins listed in the WordPress repository, have contributed to WordPress core, and organize/speak at many WordCamp conferences worldwide. By allowing us to streamline and optimize the efficiency of the client website update process, ManageWP saves Maintainn time, which means we also save money. We can pass that cost-savings onto our customers and keep our maintenance fees nominal. The manual process of updating 300 plugins for 165 websites would normally take us 82.5 hours. With ManageWP, we’re able to complete the update process for all 165 websites and 300 plugins in an average of five hours. With a five-person team, Maintainn may be small in size, but our demand for dedicated client services continues to grow. We need to incorporate the most efficient ways to reliably manage 165 websites and 300 plugins, without it being a time-consuming, expensive process. Plus, we also need to keep an accurate record of updates and website histories, without relying on old-fashioned spreadsheets. 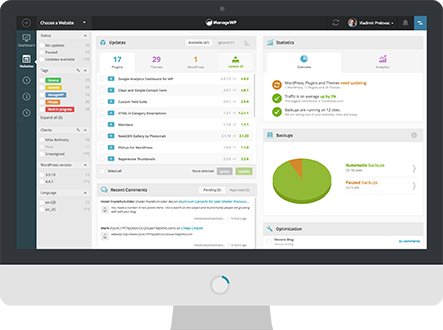 ManageWP automates our WordPress core, theme, plugin, and update processes. We can keep a recorded history of site updates and internal communication between our support team within the ManageWP dashboard. The ManageWP user experience is incredible. By utilizing tags, we can easily identify the different client types or categories without having to sort through the many clients we now manage. Again, this kind of efficiency saves us time and money. With ManageWP, Maintainn can facilitate updates in one business day. As a result, we can offer lower support subscription costs to our clients, while maintaining a high level of service quality. We can then focus on the other needs of our customers, such as custom development. We recommend ManageWP to anyone who relies on WordPress for their website, from small businesses to large corporate entities. Our team has even been known to recommend ManageWP to bloggers at WordPress meetups!